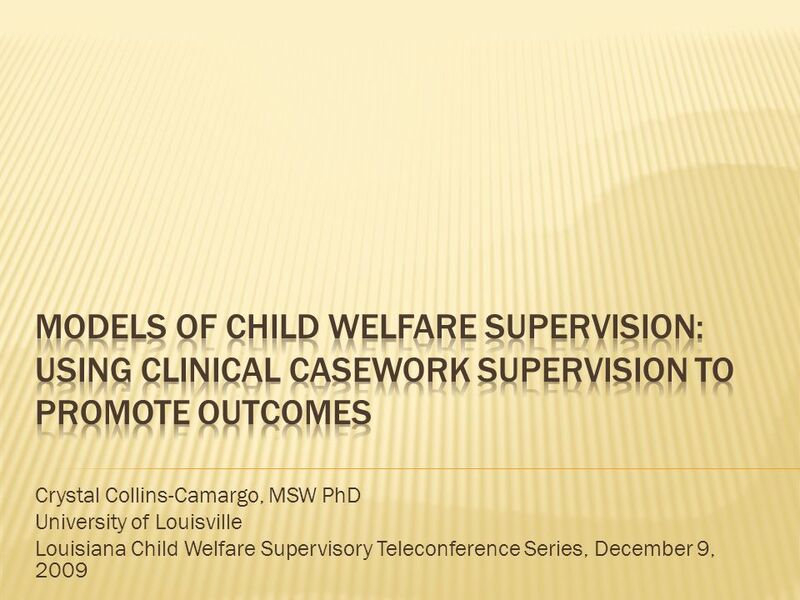 Crystal Collins-Camargo, MSW PhD University of Louisville Louisiana Child Welfare Supervisory Teleconference Series, December 9, 2009. 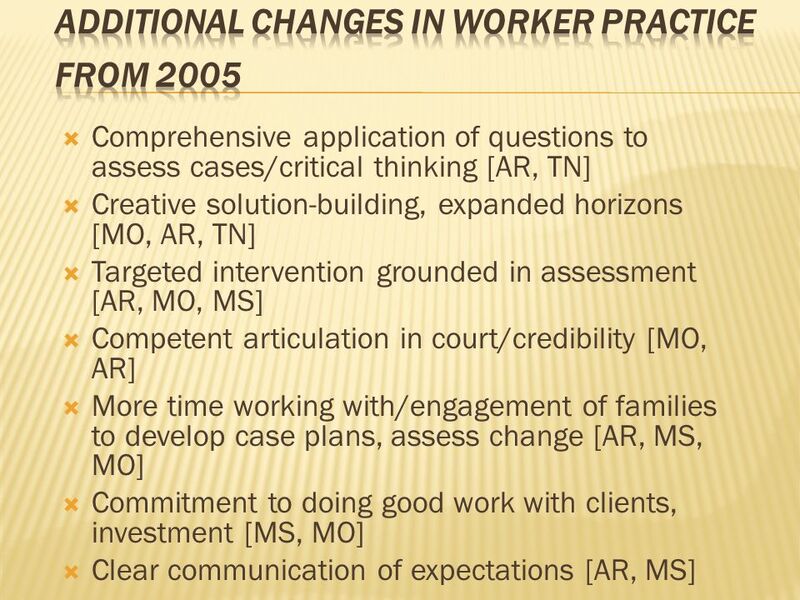 9 A well-defined series of activities purposefully conducted in the supervision of CW workers designed to create a supportive organizational culture promoting learning and an outcomes-oriented approach, enhance workers ability to think critically and make good decisions regarding the assessment of their cases and application of information gained in their intervention, and to promote evidence-informed practice. 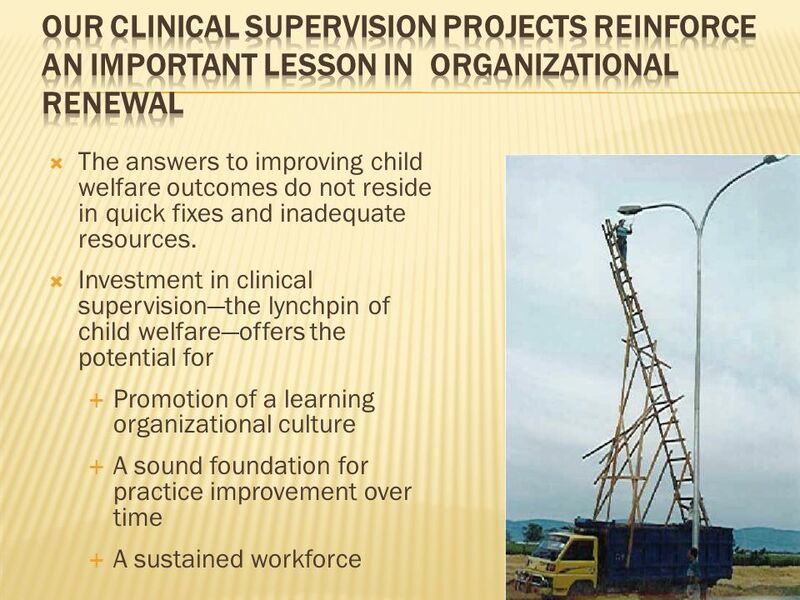 Yes, clinical supervision shouldand doesoccur in child welfare! 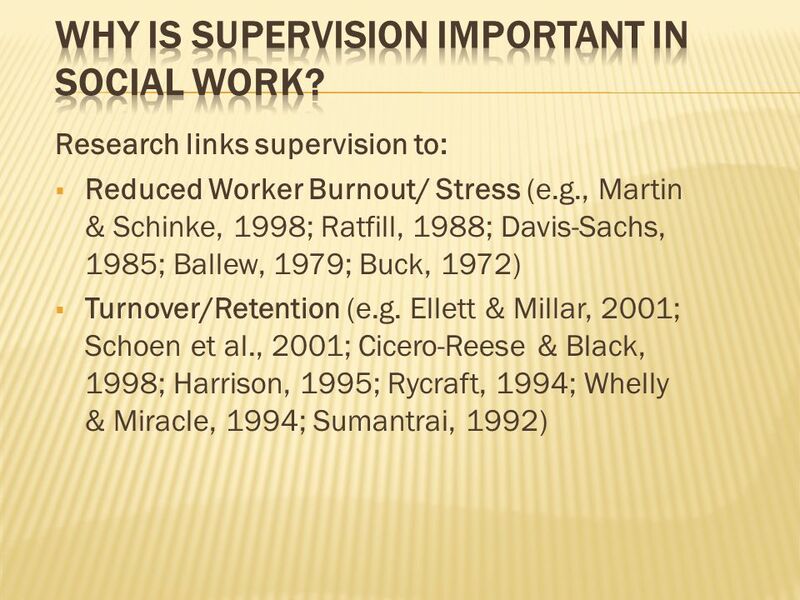 13 supervision conferences Scheduled individual or group supervision conferences; critical thinking Enhancing worker critical thinking skills; worker self-reflection; Promoting worker self-reflection; important casework questions Promoting worker identification of important casework questions at the heart the family maltreatment and their application in assessment and treatment; evidence-based practice Modeling evidence-based practiceboth in looking to the professional literature for guidance and in the implementation of an outcomes orientation to their work; organizational culture Establishing an organizational culture in which support, learning, and clinical supervision and consultation are encouraged; and, case review, observation Using case review, observation, and similar methods to assess worker skill and gauge progress. 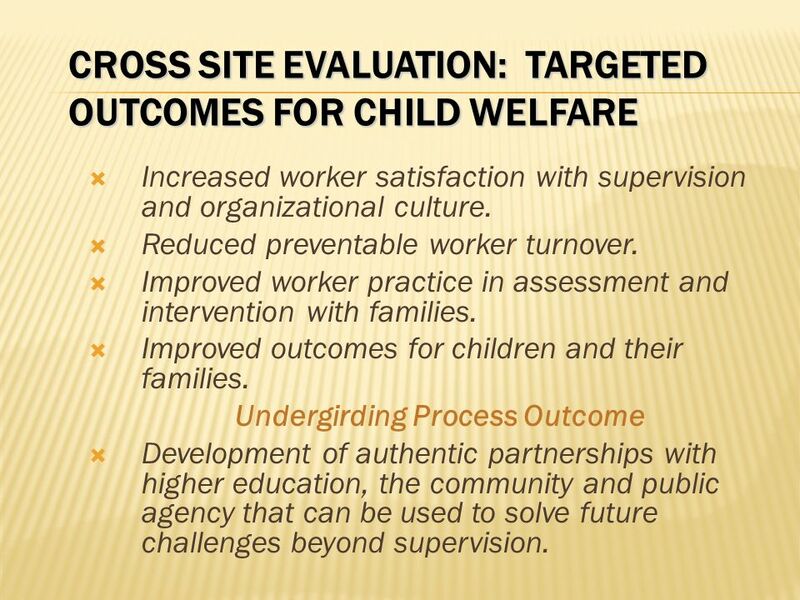 17 CROSS SITE EVALUATION: TARGETED OUTCOMES FOR CHILD WELFARE Increased worker satisfaction with supervision and organizational culture. Reduced preventable worker turnover. 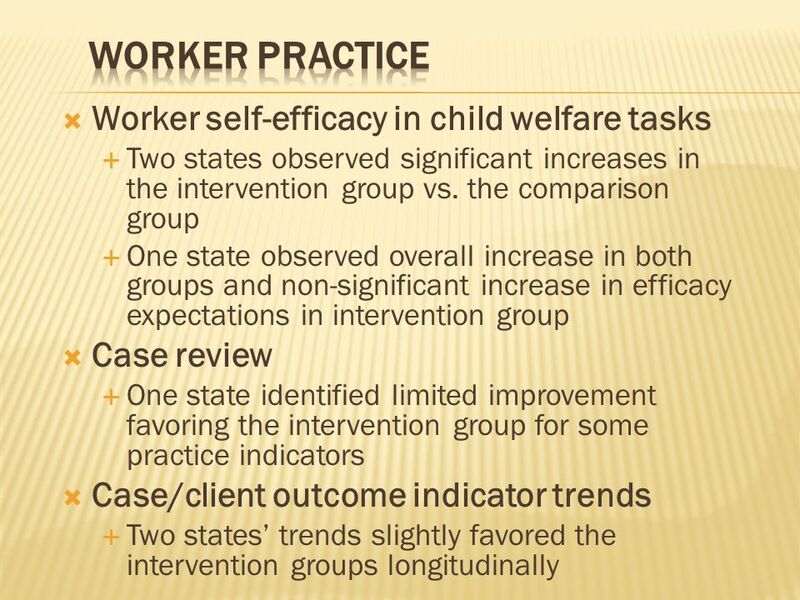 Improved worker practice in assessment and intervention with families. 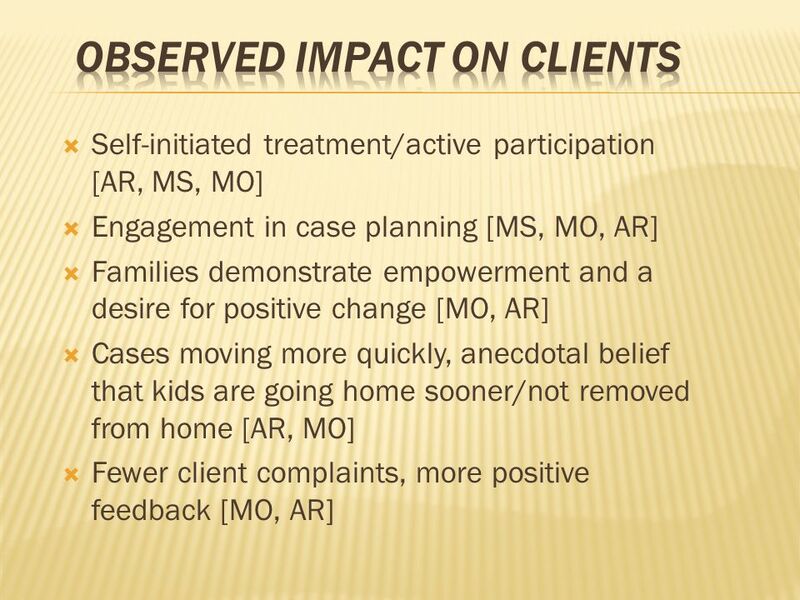 Improved outcomes for children and their families. 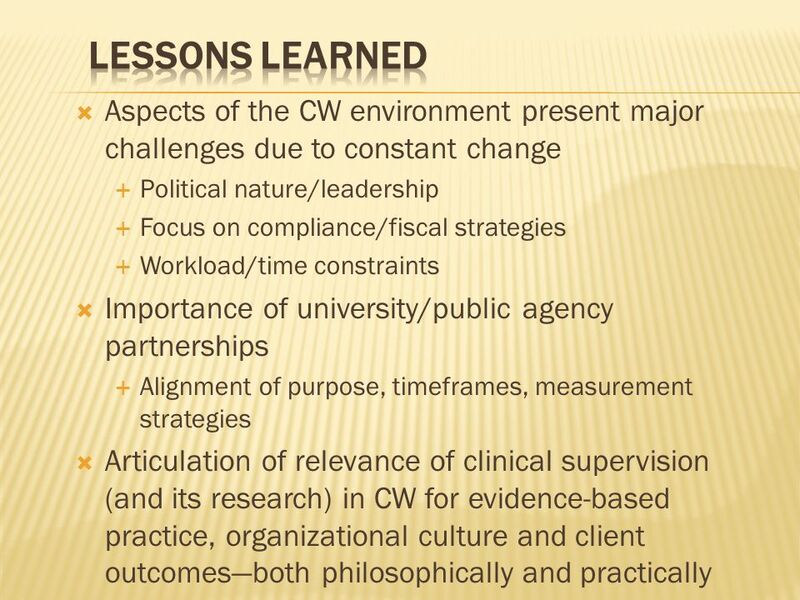 Undergirding Process Outcome Development of authentic partnerships with higher education, the community and public agency that can be used to solve future challenges beyond supervision. 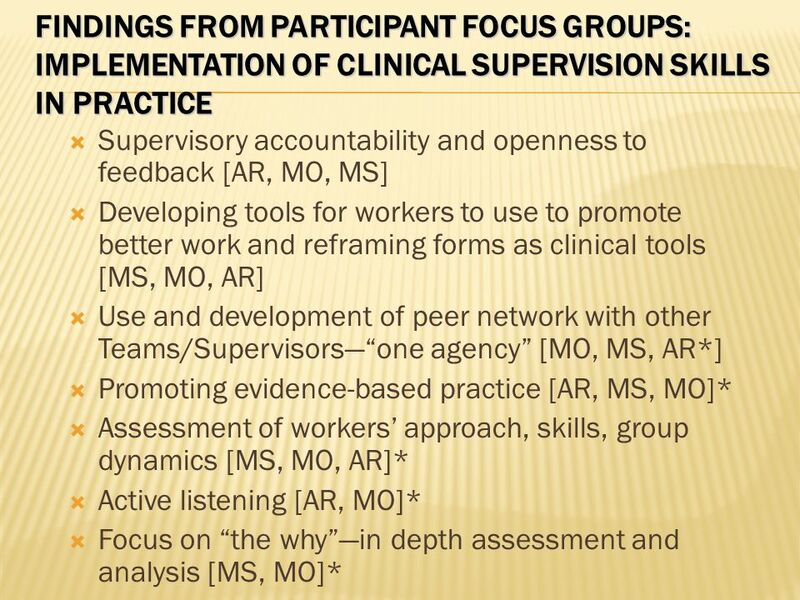 20 Projects experienced significant barriers re: sample size of matched responses over time and some instrumentation issues. 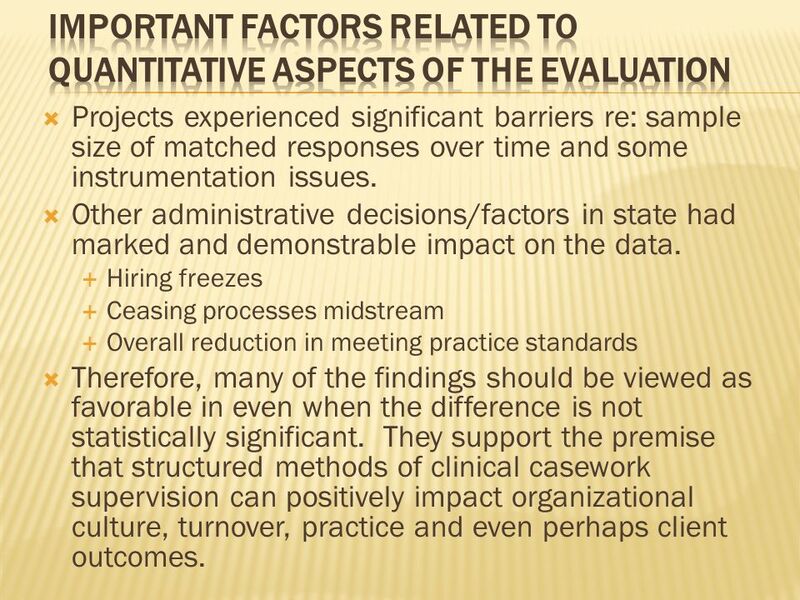 Other administrative decisions/factors in state had marked and demonstrable impact on the data. 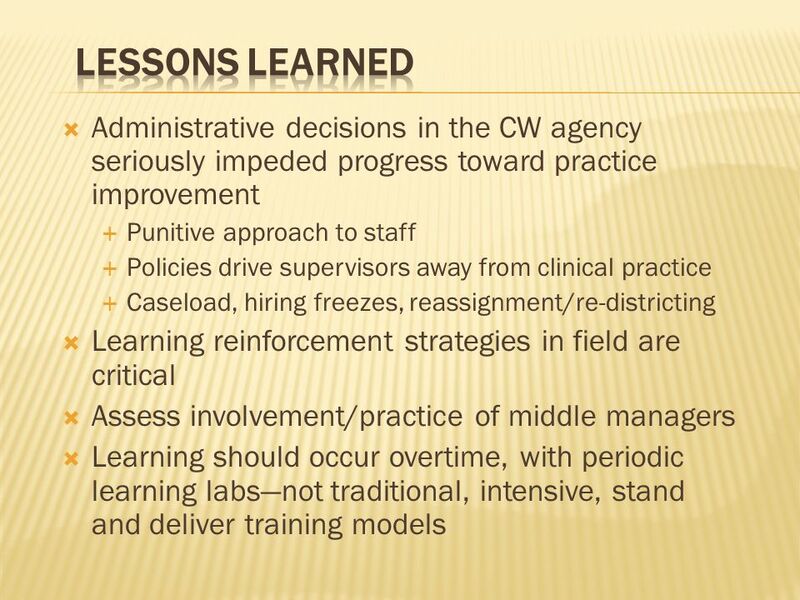 Hiring freezes Ceasing processes midstream Overall reduction in meeting practice standards Therefore, many of the findings should be viewed as favorable in even when the difference is not statistically significant. 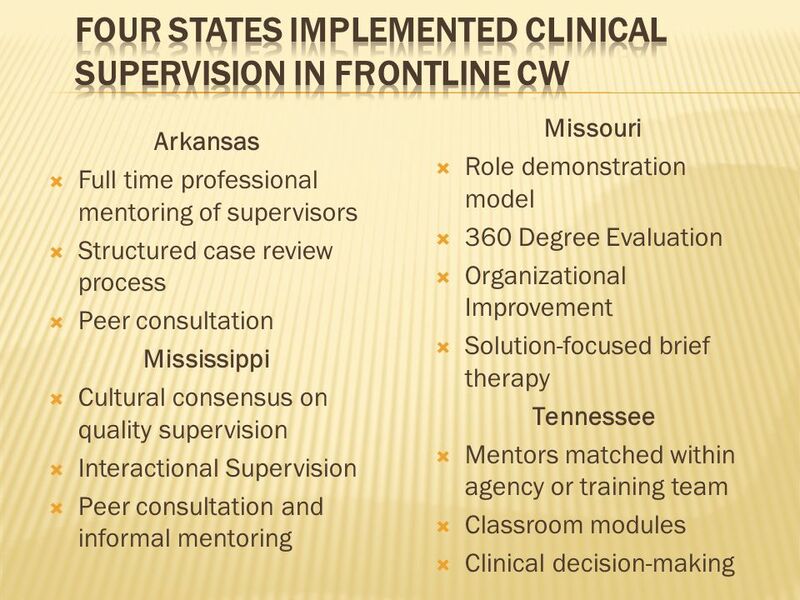 They support the premise that structured methods of clinical casework supervision can positively impact organizational culture, turnover, practice and even perhaps client outcomes. 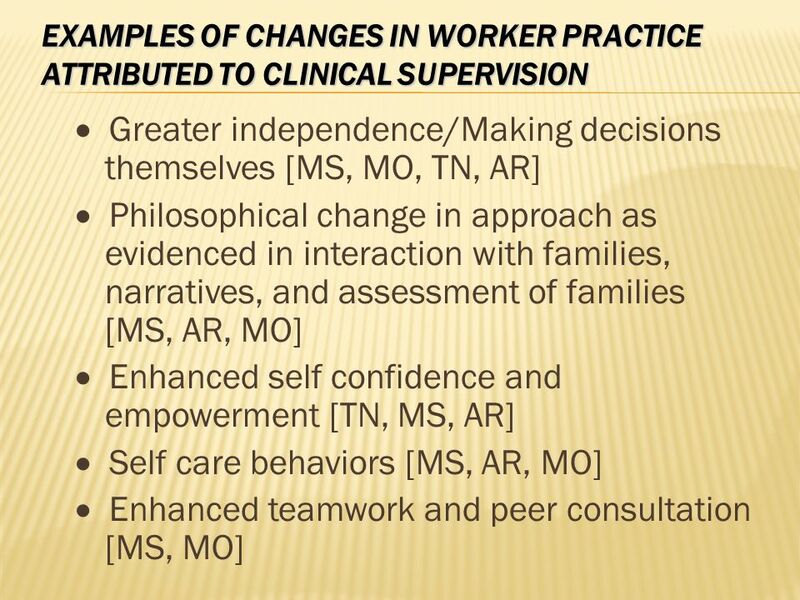 22 I think the more we as supervisors realize we empower the worker by letting them make their own decisions and modeling that with the client, they see that we are not coming to them as I know it everything and I have all the answers, listen to what I say. We are coming at it from a different approach and they are more willing to say I have learned a lot. I think their growth has helped us. 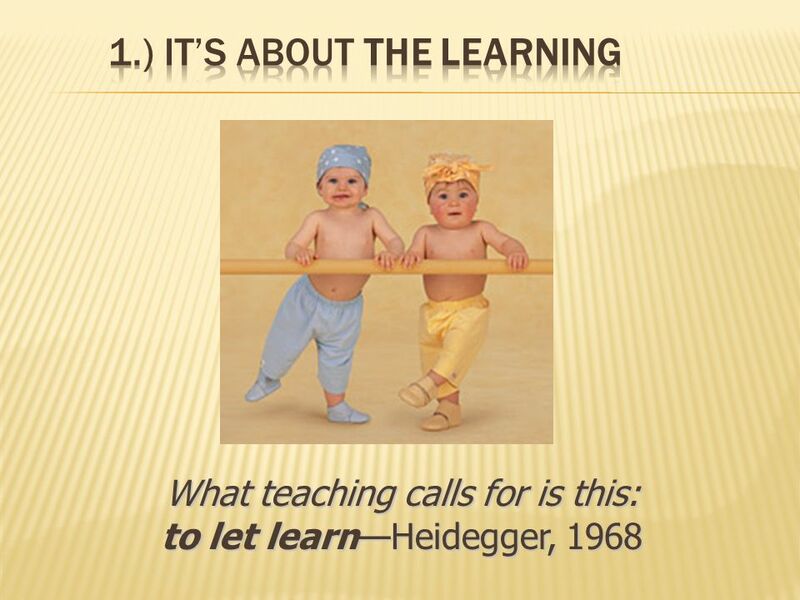 I have been trying to teach my workers to look at [assessment] a little differently. It is not their assessment it is the familys assessment. Let the family take ownership. Let the family state what their strengths are. This has been a change. 24 I also have to step back some and really try to focus them on getting them to understand how to think critically about their cases. I would just ask them questions to get them to think. 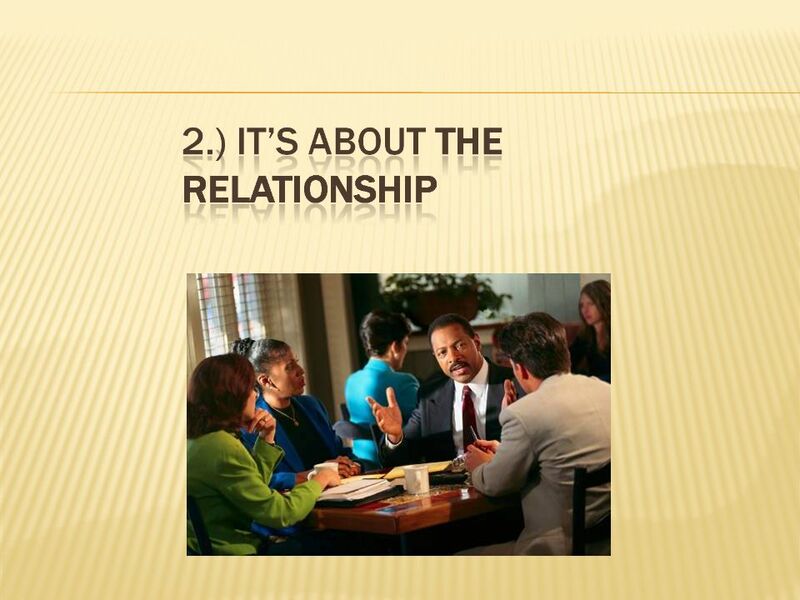 When we go to have our meetings and everybody else starts talking it would be more driven by the workers than by me. Instead of having a unit meeting and me talking…I would start saying tell me about an interesting case you had this week. Then it was like it was not just me but others and I was sitting back just listening to everything. 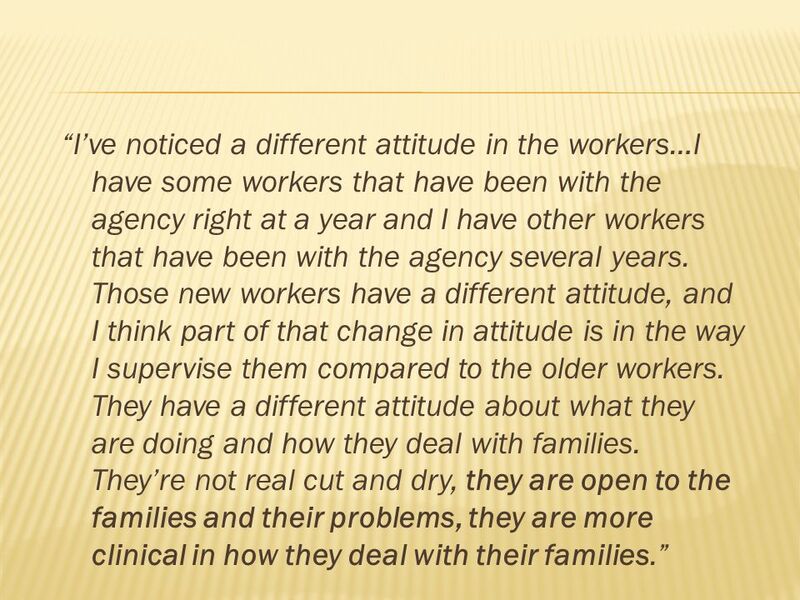 26 Ive noticed a different attitude in the workers…I have some workers that have been with the agency right at a year and I have other workers that have been with the agency several years. Those new workers have a different attitude, and I think part of that change in attitude is in the way I supervise them compared to the older workers. They have a different attitude about what they are doing and how they deal with families. Theyre not real cut and dry, they are open to the families and their problems, they are more clinical in how they deal with their families. 28 The workers are speaking for themselves now instead of always relying on me to make the decision. They are thinking of different options … and taking the initiative to go out there and do it where as before it was kind of like …a tell me what to do kind of thing. They are trying to get families to participate, and the more they participate the more likely they are to accomplish their goals. 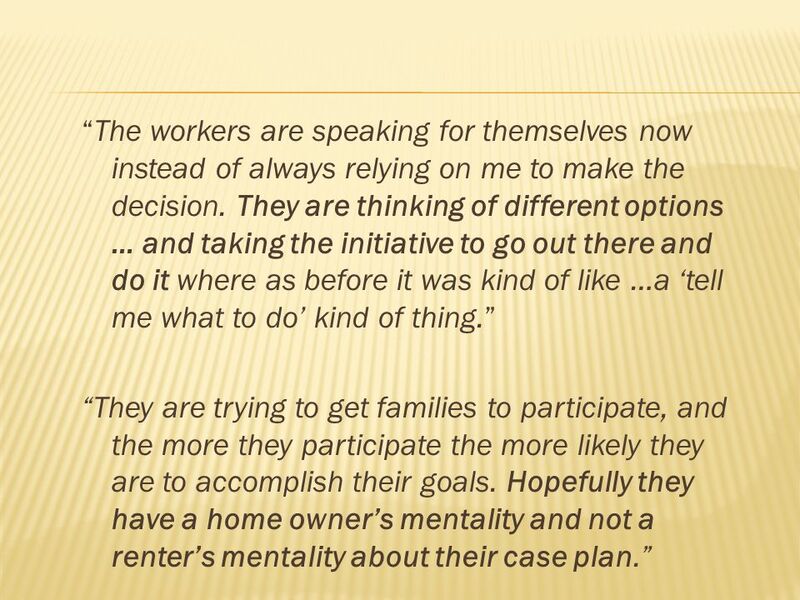 Hopefully they have a home owners mentality and not a renters mentality about their case plan. 30 [Parents] are wanting to be more of a participant. When in the past …the only thing that was making them do it was a court order. It was not so much that I really wanted to do it to help myself. I want to do it just to satisfy the court and then I can get my child back. 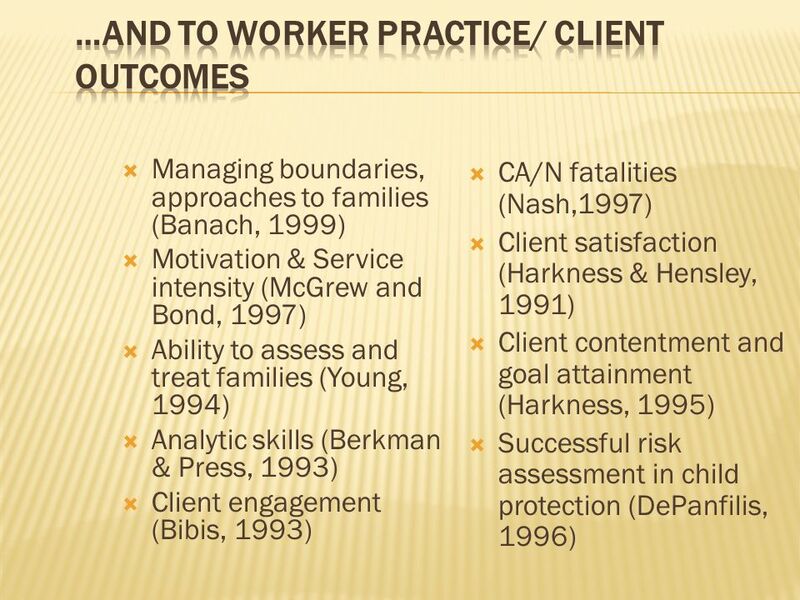 …then it began to change so now I have a relationship with this worker and I want to do this because she sincerely cares and I want to get my child back not because I have these mandates on me. When you compare how many reports you get compared to children are removed the percentage is really, really low. There has to be some social work done. 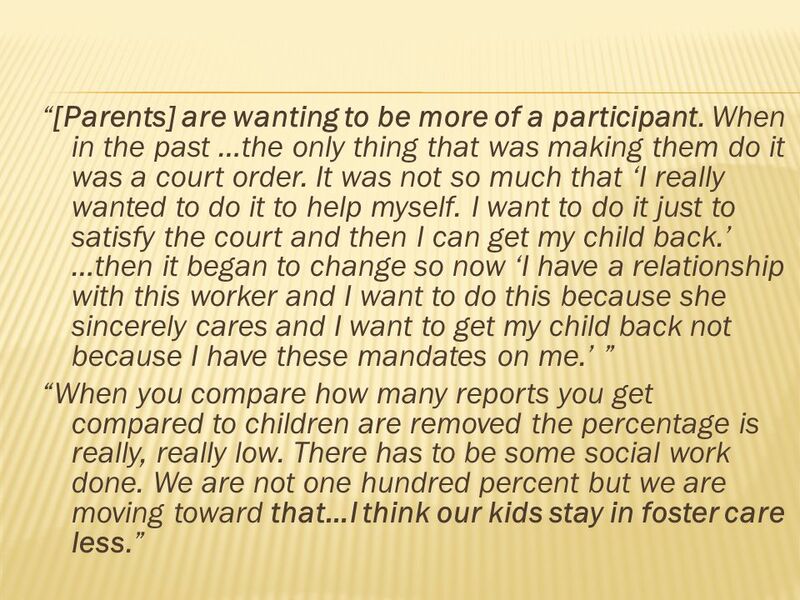 We are not one hundred percent but we are moving toward that…I think our kids stay in foster care less. 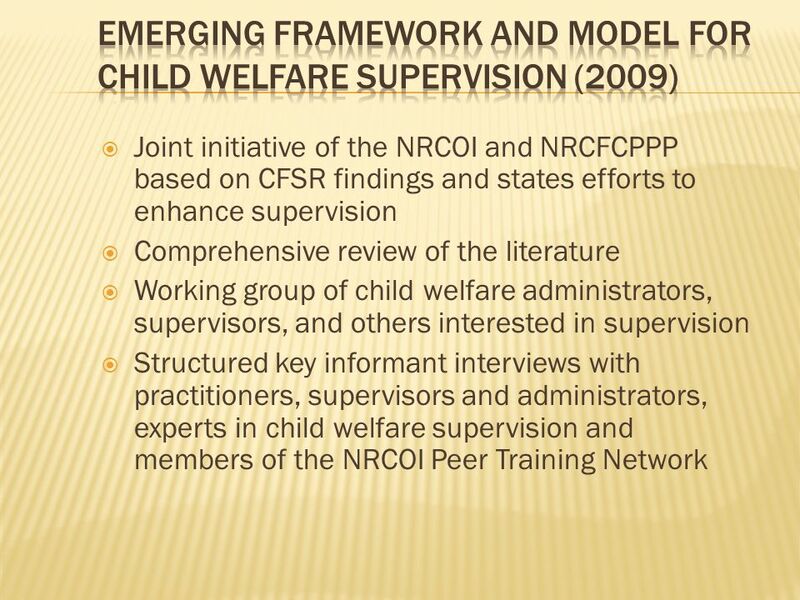 Download ppt "Crystal Collins-Camargo, MSW PhD University of Louisville Louisiana Child Welfare Supervisory Teleconference Series, December 9, 2009." 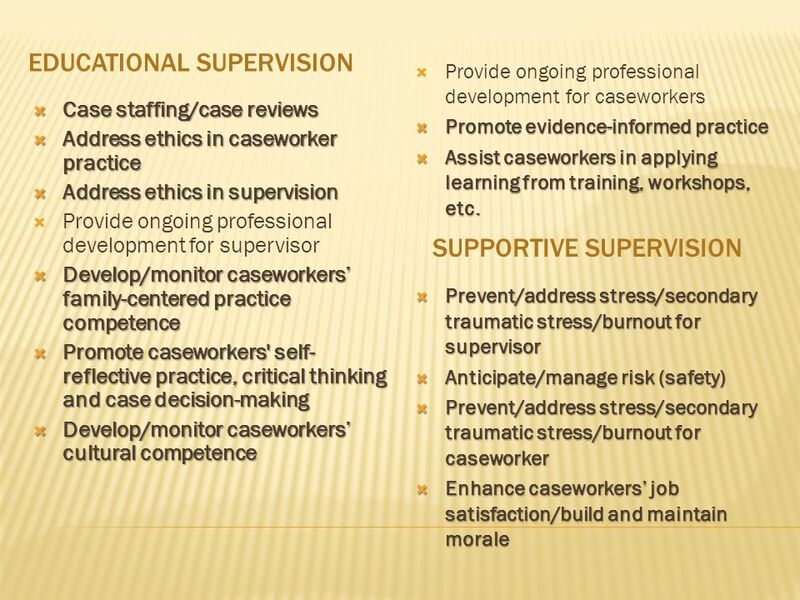 Objectives Present overview & contrast different models of case management: broker, clinical, strengths based clinical Identify roles of engagement & collaboration. Nancy S. Dickinson, MSSW, PhD The Use of Evidence in Child Welfare Practice and Policy: An International Perspective on Future Directions Jerusalem, May. 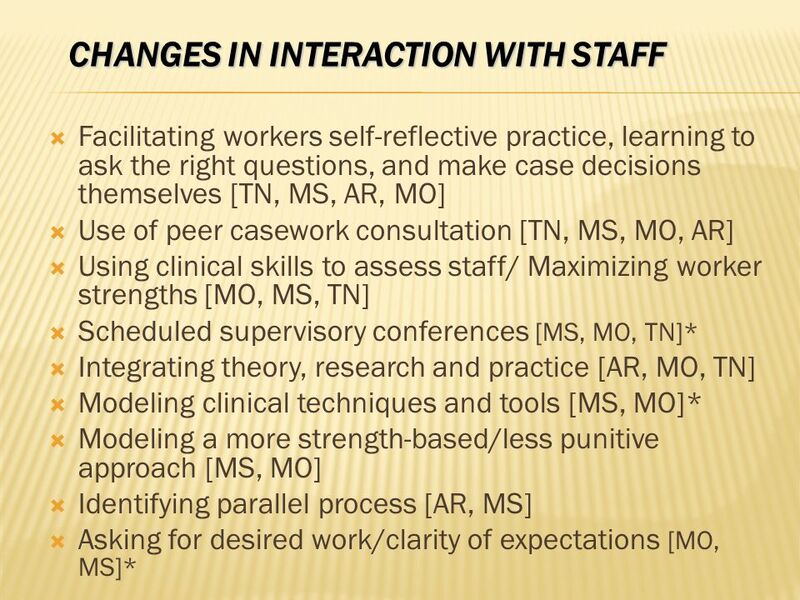 From QA to QI: The Kentucky Journey. In the beginning, we were alone and compliance reigned. Comprehensive Organizational Health AssessmentMay 2012Butler Institute for Families Comprehensive Organizational Health Assessment Presented by: Robin. 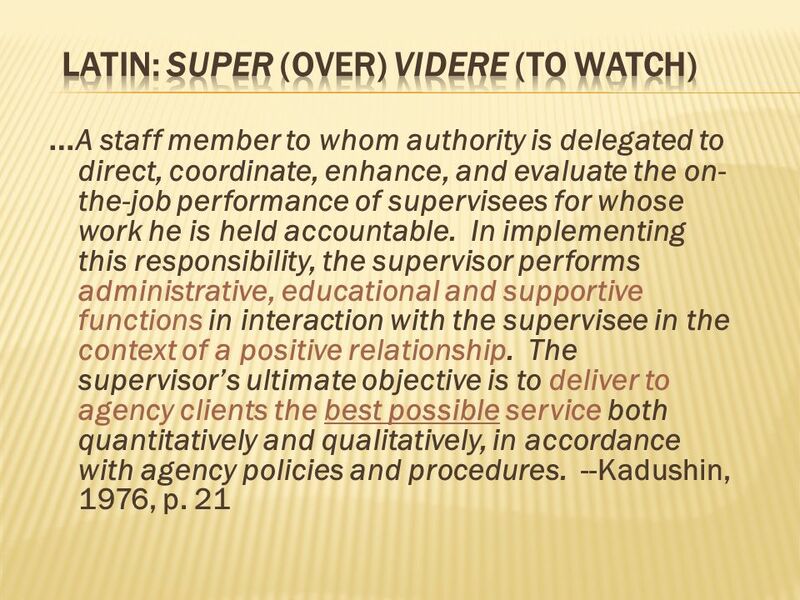 533: Supervisor Training Series Module 1: The Preparatory and Beginning Phases of Child Welfare Supervision. Kansas Kansas Workforce Initiative The Importance of Supervisors Michelle Levy and Roxanne Emmert-Davis September 15, 2010. 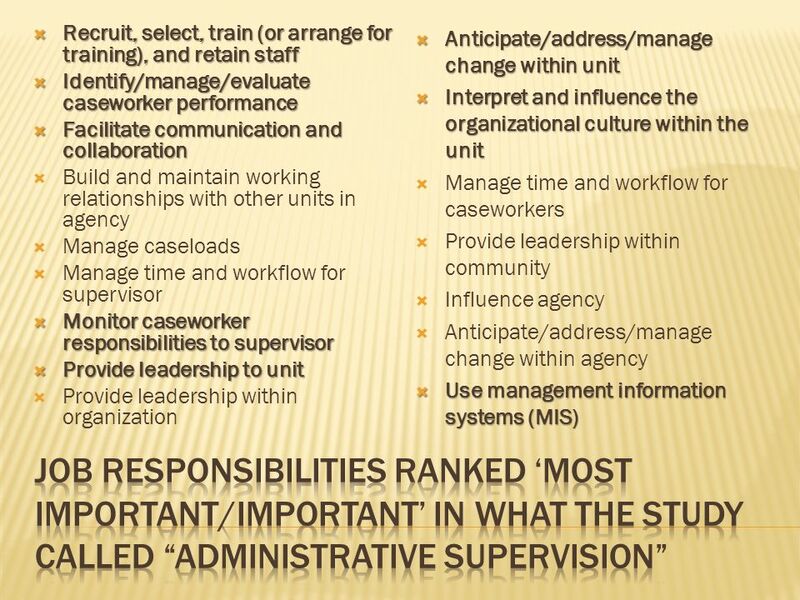 School Culture The Main Condition for Student Success.